As schools, mine included, look to adopt the latest portable or mobile devices, I am wondering if the decision makers are also considering whether or not the school is ready for a post PC device. I know our school is testing iPads in one class while another class uses MacBooks. Granted, the iPads are brand new and the laptops are 4 years old but the differences are pretty stark. I thought about this starkness more after reading the Steven Levy article in Wired on Jeff Bezos about Amazon and the Kindle Fire. While the Kindle Fire is not an iPad, I do think it is an interesting device that deserves attention. My observations are that I believe there are 3 strong contenders for device choice in schools today. Sorry Wintel machines, but I am first an Apple Fan Boy and second a Google Fan Boy. I have never been a Windows Fan Boy as I learned on a Macintosh and have made my career using Apple devices and Google services. The iPad is a wonderful device for consuming, creating, learning, reading, and investigating many of the powerful learning apps that are available. I think it takes a teacher willing and able to invest the time along with her students to learn how to add the device to the normal class routines. Many teachers may not have the aptitude, energy, or desire to allocate the time to not only bring in a device, but one that behaves unlike any device that most teachers are familiar with to date. The iPad is both a computer and not a computer since it is a new category of device. We have had success with putting them in the class we are testing them in although we have also had failures as much as these moments of success. See my earlier Google Docs Eureka post for one example. Something so central to what students and teachers do should not be this difficult if the technology is supporting or advancing the learning. The iPad does not fit neatly into the existing system of most schools, but, can be made to fit into parts while opening up new systems. The trajectory of the iPad will no doubt continue to take it’s users to places we have not seen before, but is it the best device to put into a school that may not be interested in reshaping it’s systems like the iPad is reshaping the PC and other industries? I am of a mixed opinion as I can appreciate the enthusiasm and willingness of our students to test and work with the iPad. The project is helping them in many ways since we are able to unload some of the items from their book bags, but is it a program that can be duplicated or will the teachers be unprepared for the re-thinking that must accompany a device like this demands. No amount of training can adequately prepare a classroom for the time when half of the students were able to do X while the other half could only do Y due to the device. Granted, this is a rich arena for collaborative learning, but is it replicable? I am reminded of William Stites post about the iPad being a consumer device first and foremost. Managing the iPads is at times similar to yoga moves that you watch the instructor do but realize your body just does not bend that way. The MacBook Air features all of the things we know and love about personal computers with the advantages of being fast and light weight. We all know how it works so when the device shows up, as it already has for some lucky students, the device fits into the existing structure of the classroom. Of course, classroom management training of a class set of devices would greatly aid teachers going from not using devices into a classroom that is connected. Since our school already uses Moodle and Google Apps for Education, the Air just flows into the system without needing to adjust the system to meet the Air. This is a big difference for the time investment of teachers. It also will not necessarily move a school as far as the iPad since the internal system change will be less. How much of a system shakeup is desired should be a determing factor in choice of device. Google’s Chromebook is the 3rd choice that I see as viable for schools. While new and very different which could compare it more to the iPad, it is still mostly a PC. The main difference is that the Chromebook behaves sort of like an iPad with the familiarity of a laptop. Another big difference is the approach to business between Apple and Google in how users interact with their particular ecosystems. Using the image in the Wired Article, as a starting point for my thinking, I see Google similar to Amazon in that their plan is not device lock-in, but services lock-in which of course is less then perfect in either case. These differences appear to be here for the long term given that each company has invested a lot of money in developing the services. 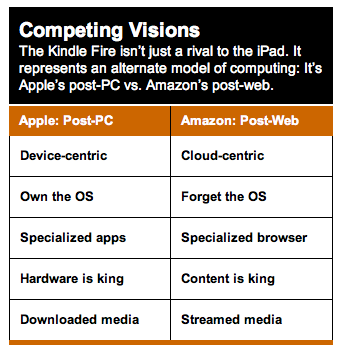 In the chart below, replace Amazon with Google and you will have a pretty close comparison between iPads and Chromebooks except for the Specialized browser since the Chrome OS is only a browser. I am intrigued by what Ravenscroft is doing with their Google Apps and Chromebook project. I think highly of the work that Jason Ramsden has done as he is a deep thinker so the fact they are piloting Chromebooks gives it credence in my opinion. I also listened to an earlier podcast from Ed Tech Talk where he discussed the plan. Before any school adopts a device based solely on cost or screen size, they should also ponder how it will fit either into the current learning system or how it will propel the learning system to be different.